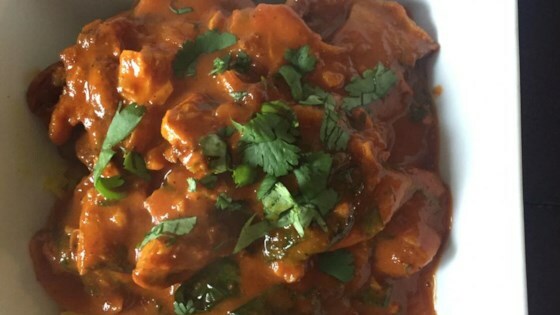 "I probably get more requests for Indian food than any other ethnic cuisine, so I was very excited to be posting this recipe for chicken tikka masala; until I found out it's actually a British recipe. This is usually done with heavy cream, but I like to use coconut milk instead; the subtle sweetness it provides works beautifully with the spices in the dish. Serve with steamed rice." You can substitute tomato puree for the crushed tomatoes, if desired. You can also use 1 2/3 cups heavy whipping cream instead of the coconut milk. Loved it. Will make again. I found it easiest to gather and put together all my ingredients before the cooking process.